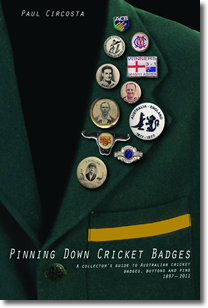 AUSTRALIAN CRICKET BADGES, BUTTONS AND PINS 1897 – 2011 by Paul Circosta“Collectors’ Guide”, providing a comprehensive coverage of over 1200 badges, most of them “with a small history and description” and identifying photographs. Signed, numbered edition of 500 copies. 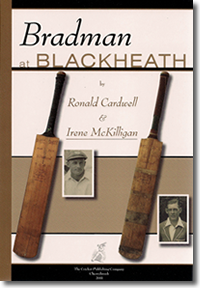 BRADMAN AT BLACKHEATH by Ronald Cardwell & Irene McKilliganThe famous match in November 1931 when Don Bradman scored a century in three eight-ball overs. 200 copies; signed by both authors. 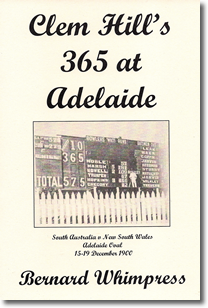 CLEM HILL’S 365 AT ADELAIDE by Bernard Whimpress Full account of the match between South Australia and New South Wales in December 1900 when Clem Hill made the higest first-class score at that time in Australian cricket. Numbered, signed edition of 100 copies. 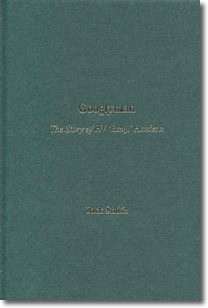 Biography of Sidney Gordon Smith, one of the world’s greatest all-rounders in the first quarter of the twentieth century, who toured England with the West Indies in 1906 and represented M.C.C. and New Zealand in unofficial Test Matches. Signed by the author. 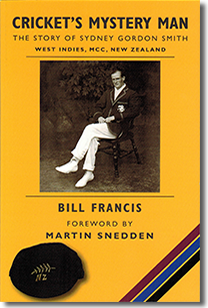 GOOGLY MAN – THE STORY OF ‘RANJI’ HORDERN by Rick SmithIn-depth biography of Australia’s first great googly bowler who met with great success in the Test series of 1911-12 but played little first-class cricket in subsequent years. 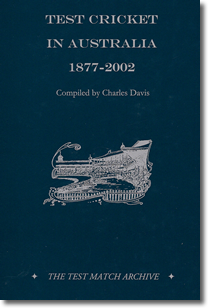 Illustrated with a large number of contemporary photographs. Signed hard-back volume; only 280 for sale. 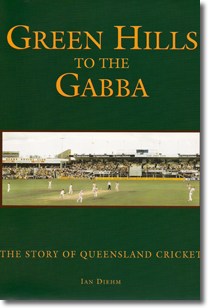 GREEN HILLS TO THE GABBA – THE STORY OF QUEENSLAND CRICKET by Ian DiehmLeather-bound, numbered edition of 200 copies, signed by Allan Border, Bill Brown, Peter Burge, Greg Chappell, Ian Healy, Carl Rackemann, Jeff Thomson and Sam Trimble. 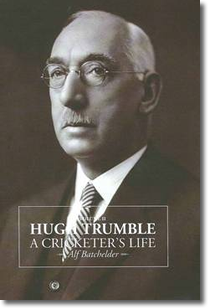 HUGH TRUMBLE: A CRICKETER’S LIFE by Alf BatchelderFull-length biography of the famous Australian bowler who took 141 Test wickets and later became a long-serving secretary of the Melbourne Cricket Club. Signed edition of 200 sets, each set containing two large illustrated hard-back volumes. 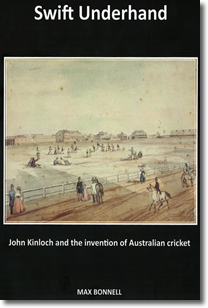 SWIFT UNDERHAND – JOHN KINLOCH & THE INVENTION OF AUSTRALIAN CRICKET by Max BonnellThe life of John Kinloch, a prominent inter-colonial under-arm bowler in the 1850’s and 1860’s, the first ‘nightwatchman’ used in Australian first-class cricket and co-founder of the New South Wales Cricket Association. Limited edition of 100 signed, numbered copies. TEST CRICKET IN AUSTRALIA 1877-2002 by Charles DavisMonumental work which contains a descriptive text section for each Test series,scorecards for all the matches, including balls faced, minutes batted and boundaries hit for nearly all the games and an expanded falls of wicket section, an Australian Test players’ register and complete sets of averages for all the players. 334 copies; 554 pages. 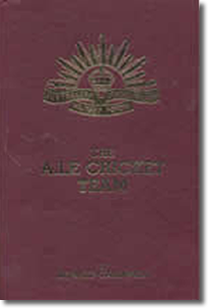 THE A.I.F CRICKET TEAM by Ronald CardwellDetailed account of the A.I.F. 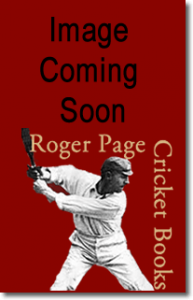 Tour of England, South Africa and Australiain 1919-20 when a team, which almost sprang from nowhere, won 25 matches by sparkling batting, animated fielding and penetrative bowling. The book includes descriptions of all matches, studies of the players, full statistics and 27 rare photographs. 200 copies. TRIUMPH AT WATTLE FLAT by Richard MackAccount of the celebrated match in March 1862 when a Castlemaine & District XXII defeated the first England touring team to visit Australia. 300 signed copies.